Are you planning on moving abroad for 6 months or a year? Check out Danni’s female packing list for living abroad, perfected after living in 8 countries. A Birthright trip to Israel is often action-packed, so packing carry-on only is essential. Find out what to bring in Shoshana’s ultimate female packing list for Birthright. We love to pack light at Her Packing List. Katie shares her minimalist packing list to help you bring less of what you don’t need and enjoy traveling more. The most comprehensive packing list for a ski trip you can find – targeted to newbies. Choose the right clothing and prep for the slopes with our guide! Ireland’s weather can change in an instant, especially in summer. 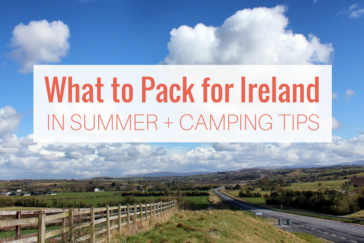 Jordan shares her packing list for Ireland plus helpful camping tips for those sleeping outside. The best time to visit Cape Cod is in early fall when the tourists are gone but beach weather hangs around. My packing tips and list should get you ready and sorted. Check out Stephanie’s packing list for Papua New Guinea with tips for different regions and climates, including the Sepik River region. If you’re visiting New England in winter, you’ll need to bundle up. Jessie shares her cold weather packing list for New England to help you prepare. Cyprus is warm almost all year, and the small island is packed with history, ruins, beaches, and gorgeous landscapes. Ali’s packing list for Cyprus should help you prepare!